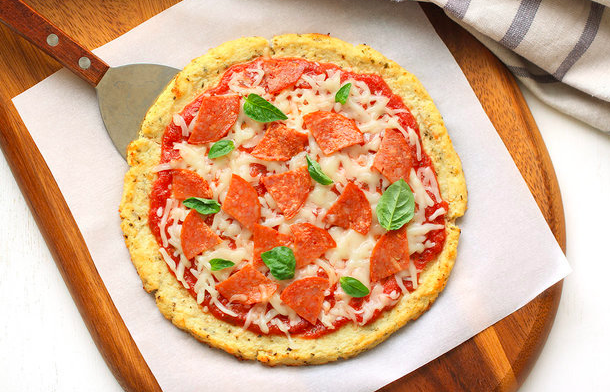 It’s recipe time at Beacon and we are here to say pizza can be flour-free and satisfying! This recipe comes from one of our favorite recipe sources, Hungry Girl. Of course if you want to swap some of the toppings for different veggies or protein, feel free! Working in batches as needed, pulse cauliflower in a food processor until reduced to the consistency of coarse breadcrumbs. Place cauliflower in a large microwave-safe bowl; cover and microwave for 3 1/2 minutes. Uncover and stir. Re-cover and microwave for another 3 1/2 minutes, or until hot and soft. Transfer cauliflower to a fine-mesh strainer. Let cool for 10 minutes, or until cool enough to handle. Return cauliflower to the bowl, and add all remaining crust ingredients. Mix thoroughly. To form the crusts, evenly divide cauliflower mixture into two circles on the parchment-lined baking sheet, each about 1/4-inch thick and 7 inches in diameter. Bake until the top has browned, about 35 minutes. Meanwhile, in a medium bowl, combine crushed tomatoes, garlic powder, onion powder, and Italian seasoning. Mix well. Spread seasoned tomatoes over each crust, leaving a 1/2-inch border. Evenly sprinkle with cheese, basil (if desired), and pepperoni. Bake until cheese has melted and crust is crispy, 5 – 7 minutes. Click on this link for the full recipe and more!